The capacity to persuade is a vital currency: it fosters active civic participation and affords access to power in a democracy. Developing persuasiveness therefore has an important place in education. Yet not all forms of persuasion are equally commendable. Reasoned argument promotes integrity in a way that manipulative tactics like cajolery or disparagement do not. The NAPLAN persuasive writing test fails to give due weight to cogent argument, critical engagement with ideas or even meaningful use of language. In this regard, the NAPLAN persuasive writing test is gravely misaligned with worthy educational goals. In my professional development work, I often hear teachers bemoan this pressure to narrow their curricular focus and ‘teach to the test’. Teachers are frustrated by their powerlessness in the face of the perceived behemoth of NAPLAN testing. They sense their autonomy being stifled by the high-stakes standardised nature of the testing, by the publication of results on league tables, and by those results being used as an unofficial measure of teaching quality. The mention in the Parliamentary Inquiry report of excessive time being spent on teaching persuasive writing struck me as a surprising example of the widely deplored practice of ‘teaching to the test’. If you believe, as I do, that advocacy and critical engagement with ideas are crucial for democratic citizenship and ought to be a central concern for educators, then you might well assume that the teaching of persuasive writing merits a great deal of class time and attention. What’s more, teaching to a test is not necessarily a bad thing. If testing were appropriately aligned with worthy learning goals, teaching to the test would achieve the very purpose for which the system was designed – that is, educating students. The documented narrowing of curricular focus suggests, however, that tests like NAPLAN are missing the point: they are badly out of alignment with our educational goals and priorities. When teaching is test-focussed but the test fails to measure what counts, no one can be surprised to find that learning is derailed. Expert research and analysis lends substance to the idea that what the NAPLAN test measures is at odds with what really matters in education. The NAPLAN writing test was recently designated ‘by far the most absurd and the least valid’ of a dozen comparable tests, according to Dr Les Perelman, the author of a report commissioned by the NSW Teachers Federation. ‘The marking criteria in general I can only describe as bizarre,’ Perelman said. ‘When I first examined it, I just couldn’t believe it. It’s measuring all the wrong things.’ Relative to the other tests Perelman surveyed, NAPLAN gives significantly more weight to the mechanics of writing (spelling, punctuation, paragraphing and grammar) and significantly less weight to conveying meaning. This is preposterous, as Perelman points out, considering that the very purpose of writing is to communicate ideas and information. The calculation of the spelling mark is particularly farcical. For a student to earn full marks for spelling in an assessed piece of writing, it is not sufficient that all the words be correctly spelled; at least ten words defined by the Australian Curriculum, Assessment and Reporting Authority as ‘Difficult’ or ‘Challenging’ must also be included. This requirement compromises the communicative function of language in a way that is truly bizarre. Perhaps the most ludicrous feature of the NAPLAN persuasive writing test is the choice of writing prompts. In 2014, the prompt ‘Which law or rule would you make better in your view?’ was widely criticised, with even ACARA chief executive Robert Randall conceding that ‘the question may have been confusing for some primary school students’. In addition to being ungrammatical – a serious indictment in the context of a literacy test – the question appears to be an egregious example of ‘design by committee’, characterised by illogicality, needless complexity and a lack of unifying vision. The persuasive writing prompt in 2011 was likewise poorly conceived. ‘People like to play with toys and games to have fun and to relax,’ it began. ‘Some people think that too much money is spent on toys and games. They think the money could be used for more important things. What do you think? Do you agree or disagree?’ Given the vagueness of this prompt, it would have been extraordinarily difficult for students to respond in a logically defensible way within the endorsed five-paragraph response structure. Is Too Much Money Spent on Toys and Games? It is important for human beings to set aside time for leisure and recreational activities in order to relax and enjoy themselves. However, it is not abnormal for people to become obsessed by such activities and spend too much time and money on them. As a teenager/adolescent, the reality is, a lot of time and money will often be spent on video games or toys for younger children. I believe that money spent on such things should be regulated. As I mentioned earlier, it is important for us to participate in leisure and recreational activities. The reality is, many of these activities cost money, and that money is money gone from you or your parents/guardians savings. It is unnecessary for someone to purchase 10-15 video games when the person only really plays 4 or 5. This is ironic, because I, myself, am a culprit of such a thing, but I have learnt the hard way to spend my money more wisely. Not only does spending too much on games and toys lose you or others money, it also makes you lose interest in more productive activities such as sports which keep you fit and healthy and expand your social networks. Although I and many others wish it was the case, playing with toys and video games doesn’t exactly get you physically fit, although some games have been proven to improve eyesight and mental ability. Although I have talked about the costs that games and toys can incur if not used in moderation, I still believe it is important to allocate some money to such activities, to keep the person in a good frame of mind. However, spending too much money on these activities can also cause one to develop bad habits regarding how they spend their money as an adult. It is important for young adults to learn that leisure time is only one facet of life, and that everything should be done in moderation. In conclusion, I believe it is important to allocate time and money to toys and games, however, everything must be done in moderation and it is an important role of parents/guardians to ensure that time and money spend on these activities is regulated. This piece of student writing is inadequately argued and peppered with repetition, non-sequiturs and clumsy wording. Nonetheless, the marker commented that ‘all components are [structurally] well developed’; ‘ideas are carefully selected and crafted to be highly persuasive… [and] presented in a well organised manner’; and ‘cause and effect reasoning leads the reader through the text’. I am astounded by this favourable evaluation. I believe it justifies Perelman’s assertion that this kind of testing subverts, rather than supports, instruction in effective writing. School leaders are mistaken if they believe that the development of students’ critical thinking is a corollary to NAPLAN test preparation. The truth is that excelling on the persuasive writing test says very little about students’ capacity for reasoned argument. The recent Gonski report recommends giving increased prominence to students’ acquisition of critical and creative thinking in order to prepare students for the rapidly changing world of work. The recommended development of ‘learning progressions’ – enabling teachers to make reliable, criterion-referenced assessments of students’ attainment in thinking – certainly sounds like a step in the right direction. Of course, educators will need to think seriously about what the attainment goals should be, lest we inadvertently cultivate a high level of proficiency in shallow or fallacious thinking. I’ve written How to think about a persuasive writing task to demonstrate the kinds of discussion questions that teachers may find useful in helping students to formulate their own coherent and well-reasoned arguments. This article first appeared on the blog John Menadue – Pearls and Irritations and subsequently appeared in the print journal The Australian Rationalist. I’m troubled by how argument is presented in the widely-used textbook Argument & Persuasive Language: For the new VCE Study Design 2016 – 2020 by Melanie Napthine. At a pinch, I’m willing to go along with the metaphor of an argument as a cake, made up of reasons (ingredients) that are inferentially connected (combined in a certain way), and that better quality reasons (ingredients) will make for a better argument (cake). I don’t think it’s a great metaphor, but it’ll do. And, okay, let’s agree that persuasive language is the embellishment (icing, etc) that make the argument more appealing to an audience. But what’s this? ‘Combining…ingredients in the best possible way will ensure a cake that your audience will appreciate’? Combining reasons in the best possible way (which I take to be a vague way of saying ‘logically connecting your premises and conclusion’) is just what makes a valid argument, regardless of whether your audience appreciates it. More concerning still is the possibility that the author genuinely means to suggest that a good argument consists of good reasons combined in whatever way the audience most appreciates, even if that means producing a fallacious argument. The textbook’s failure to distinguish good reasoning from fallacious reasoning in its ‘summary of the main argument techniques’ (in which emotional appeals, ad hominem attack, question-begging and straw-man argument are interspersed – in an undifferentiated list – with legitimate argument techniques like deductive and inductive reasoning) makes me suspect that VCE English students are getting the message that anything goes in the interests of persuasion. Are we educating a generation to be marketers and spin-doctors rather than deliberators and reasoners? To be sophists rather than philosophers? 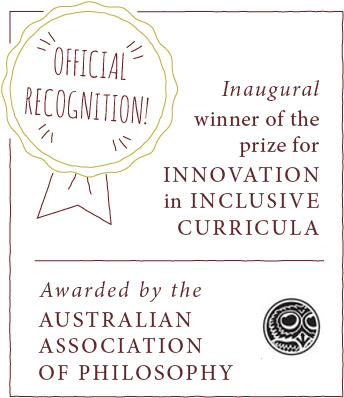 The Philosophy Club works with teachers and students to develop a culture of critical and creative thinking through collaborative enquiry and dialogue. When I shared this post to another forum, someone commented that the use of persuasive strategies inevitably corrupts subject matter, and that persuasive strategies therefore have no place in a democratic or civil society. In response, I would draw attention to the idea that there are various ways of being persuasive, including – at one end of the reasonableness scale – making cogent arguments in line with the classical idea of ‘logos’; and at the other end of the reasonableness scale, making emotive appeals in line with the classical idea of ‘pathos’. I think that the commenter and I were in agreement that we need to teach students how to make well reasoned, evidence-based arguments; and that we need to teach students about emotive appeals only so that they can respond defensively to unsound arguments that rely on pathos for their persuasiveness. Bearing in mind the distinction between logos and pathos, I think it’s fair to say that only certain kinds of persuasive strategies corrupt the truth, and these alone are the kinds that do not belong in a civil society. Teaching students how to argue reasonably is also a way of teaching persuasiveness, and – in my view – an indispensable element in education for democratic citizenship. My views on the importance of teaching this kind of persuasiveness are informed by the paper Discovering Argument: Linking Literacy, Citizenship Education, and Persuasive Advocacy by Peter Brett and Damon Thomas. In it, the authors suggest that educated people should ‘be able to articulate a position on important matters so as to persuade colleagues, fellow citizens, governments and bureaucrats’ and they further assert that ‘[a]dvocacy, campaigning, and taking informed action are at the heart of effective citizenship education… [and] it is important for active citizens to be able to engage critically with ideas and proposals for which a range of public persuasive stakeholders and organizations are hoping to garner support.’ To me, these are persuasive (!) reasons for education systems, in a democracy, to strive to develop in students a certain kind of persuasiveness.